The only doubts I have are about the exact age - he looks closer to 18 than 15. 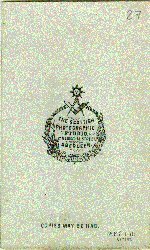 W.F.S.Hale appears to have died in 1867 when John would have been 15. With Mrs Hale carrying on the business, it is reasonable for her to use up the existing stock of card, but would she be still doing so after three years? Perhaps as a woman she was happier to run the business under her late husband's name? W.F.S.Hale, The Scottish Photographic Studio, 17 Marischal Street, Aberdeen. List dates address between 1865/6 and 1866/7, but Mrs Hale continued at this address until 1870/71. 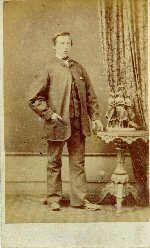 Carte de Visite photograph. Thin white card, square corners. Small trade plate on back. No name on front. Young man standing next to occasional table with statuette of the Three Graces.